Ground Control 2 Game Review - Download and Play Free Version! Your Home Planet is Under Siege and Only Your Battle Strategies Can Save it in This RTS Science Fiction Adventure! Your home planet, Morningstar Prime, is under siege by the Terrans! As captain of the Northern Star Alliance, you must destroy the Terrans and reclaim your planet before it's too late. But what will happen when an alien race, the Virons, gets involved with both sides of the war? Battle through 24 missions or play multiplayer online with more than 10 maps and a map editor to create even more challenges. In this real-time strategy game, you'll start out controlling the Northern Star Alliance. Complete missions to destroy the Terrans such as escorting an important person to safety while hordes of Terrans pursue you. Later, you can play as the Virons. A unique aspect of that race is that two units can be melded together to create a different unit. Unlike other RTS games, you don't have to build a base or collect resources. Instead, you can order reinforcements to be dropped off at your Landing Zone, but you must guard your Landing Zone at all costs. The Drop Ship that brings reinforcements can also be used during battle for huge firepower, but once it's gone you'll have to wait awhile to get a new one. If you direct troops to buildings or high ground, you gain defense bonuses. Utilize trees as stealthy hiding places and use choke points to defeat masses of Terrans. These add an element strategy and can bulk up your game tremendously. This is a unique RTS game because you can focus entirely on battle strategies and leading your troops instead of creating an economy. This game is easy to learn how to play but it still offers a variety of troops and vehicles to use in battle. The realistic graphics are stunning, complete with reflective water and realistic weapons effects to give you an exciting experience. Save your home planet now and win the war in Ground Control 2! Ground Control 2 continues the series fun and addicting real time strategy experience with a rather stunning presentation and lengthy campaign experience. What really makes the GC series stand out is the powerful 3D graphics engine which allows for some rather large maps and the ability to zoom in to view detailed units and get up close to the action. And action is what GC 2 is all about since the gameplay is striped down of some of the more mundane RTS elements like resource collecting and base building. Instead of these aspects you mainly focus on capturing victory locations and drop zones where you can then order in your dropship to bring down more troops and supplies. Resources come in the form of acquisition points which accumulate over time with the speed depending on the size of your army or can be added to by destroying enemy units and capturing victory locations. This all tends to help keep the gameplay rather fast and tactically intense as you try to keep pace with your enemies and keep your units alive so that they can gain experience and become more effective fighters. Another very interesting aspect is that every unit has a secondary mode of fire which greatly adds to the variety of gameplay options. For instance, the NSA light infantry has a regular assault rifle for their primary attack while their secondary mode lets them shoot anti-vehicle rockets from a stationary position. While in general the gameplay is rather spectacular, there are a few slight issues which might cause a few problems or turn off some gamers. For starters, the free-form camera can take a bit of getting used to and could be frustrating to players new to the RTS genre. Also, it is a bit disappointing that there are only two playable races, the NSA and Virons, which could be a bit too limiting for some players especially considering multiplayer action, yet there is quite a lot of variety with unit types and the secondary fire modes to hopefully curb this issue. 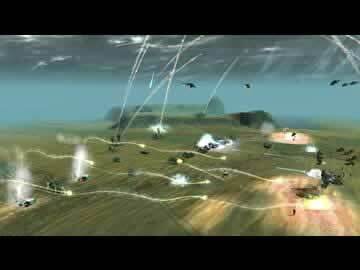 Overall, Ground Control 2 provides a fun and entertaining RTS experience that is sure to please. 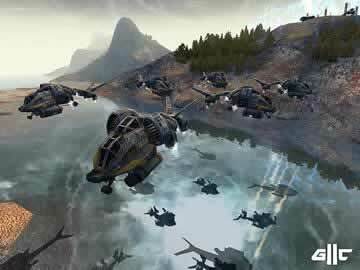 The variety in missions and tactical options give a fresh take on this classic genre and should have enough for even the most experienced RTS fan. While there are a few issues which might turn off some new players, the addicting action is more than worth any initial frustration. 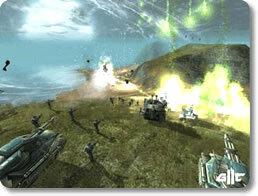 With the rather lengthy 24 mission campaign, the ability to face off against seven other players in the skirmish mode, and being able to play through single-player missions with up to three players in a cooperative mode, there are hours upon hours of gameplay to be found.